Torrevieja, November 25th, 2016. The Hospital Quirónsalud Torrevieja hosted the “III Health Tourism Forum” under the title “Radiology of health care to foreign residents in the province of Alicante”, the event brought together several experts in health and legal sectors. The rapporteurs agreed that ‘Brexit’ will not affect the health rights of British residents in Spain and were convinced that an agreement will be reached that will also benefit short-stay tourists. This forum was attended by experts in different fields, such as the managing director of the Hospital Quirónsalud Torrevieja, Francisco Fiestras, the general director of the newspaper La Verdad (co-organizer of the meeting), Antonio González, and the deputy for Tourism of the Diputación de Alicante, Eduardo Dolón; The lawyer of the law firm Heredia & Pellicer and expert in international law, Pedro Heredia, the director of the Provincial Observatory of Immigration of Alicante and professor of the university of Elche Miguel Hernández University, Alfonso Ortega; The international head of Quironsalud, Victoria Abad and the coordinator of British Associations of the Vega Baja and president of Help charity, Michelle Masson. Their aim was to send a message of “tranquility” to the British population residing in Spain, and especially in the Costa Blanca, after the “hysteria” that was caused after the triumph of Brexit. 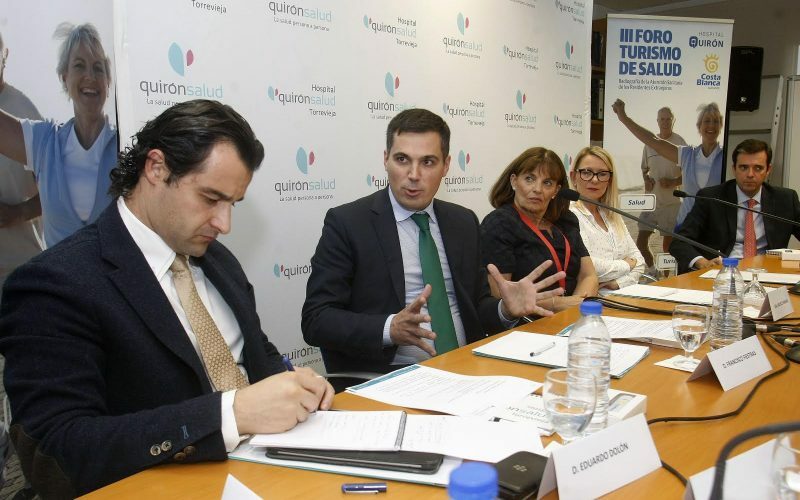 The managing director of the Quirónsalud Hospital Torrevieja, Francisco Fiestras, advocated in making hasty decisions and supports a campaign that is informative and reassuring to both tourists and residents: “They should know that their health is covered one way or another, “he added. According to lawyer Pedro Heredia, European legislation will ensure that health rights are not “restricted or eliminated”, while for tourists, it depends on the guarantees offered by the Social Security for European citizens, “There will be an agreement made”. In the last point, professor Miguel Hernández University of Elche, Alfonso Ortega, stressed that, as European citizens, they are guaranteed care in emergency situations, in the same manner as are minors and pregnant women. For further assistance, it is foreseen that a bilateral agreement will be reached between the United Kingdom and Spain due to the economic figures that are handled in the health sector between both countries. He indicated specifically that Spain is the second health supplier to the United Kingdom, by which the British paid almost 280 million euros last year. In any case, this expert opined that ‘Brexit’ is going to be soft “and finally, it will not have any effect even if it does go ahead” it doesn’t matter for a European Union of 27 countries “having the UK as a “Satellite country” having a relationship similar to that of Norway or Iceland. Help chairwoman Michelle Masson, who is in contact with many of her compatriots through the association, has blamed the English media for contributing to this misinformation and generating doubts. The concern has reached such a point that there are already cases that have been revealed, of English who have returned to their country and have put their home here for sale.